The albergue was hopping that night. The tears and fears were washed away by kids being kids. They played cards games and some made-up game I still don’t understand in the rec room. There was washer/dryer and we did laundry so were able to finally have warm, dry clothes for the next day. We piled our shoes onto the poorly-functioning radiators in hopes that they would dry by morning. (They didn’t!) I made the rounds popping blisters and applying antibiotics to the sores on kids’ feet. There was a tiny bit of warm water for slightly-not-freezing showers. But there was no heat in the room where the fourteen of us ‘slept’. When the time came for lights out, each of us piled on every piece of clothing in our packs for sleep. I slept with a hat and gloves on and shivered the night away, restless and uncomfortable. Some of the girls crammed themselves two-by-two into single beds to share body heat. At 6:30 the next morning, cell phone alarms began to chime and we awakened to shove our things into our backpacks one last time. We traipsed into the restaurant next door for breakfast and one final meeting. We decided that we should all reach the cathedral in Santiago together, so we designated a street where we would wait for all members of the group to arrive. It was already raining -make that still raining – that morning. All but three of us set off on the camino at 7:30. Since I’d injured my ankle the day before it was determined that I would stay behind with the two other students who were unable to walk that day and the other teachers would accompany the rest. I was deeply saddened by not being able to walk the last 22km. After all, I’d come all this way to walk into the city! If I had not been responsible for the students, I know I would have dragged myself to the trail and limped into Santiago, no matter how long it took. But it was my job to be there for them, so I stayed. And it was OK. The two girls and I walked to the bus stop to wait for our ride into Santiago. As we waited we were joined by six of the Melilla group. We asked what they were doing there. “We can’t do it. We can’t walk any more.” Then I didn’t feel so bad – the Camino had also taken its toll on young, strapping men who’d trained for a year to walk the Camino. The girls and I found a cafe on the designated street in Santiago to wait for the others. Soon, three-by-three and two-by-two our group began to trickle in. We all greeted one another with shouts, hugs and hurrahs. Some fell on the ground in relief and exhaustion. Some were laughing. Some were in tears. When we were all together again we walked the final yards down the street and into the plaza. 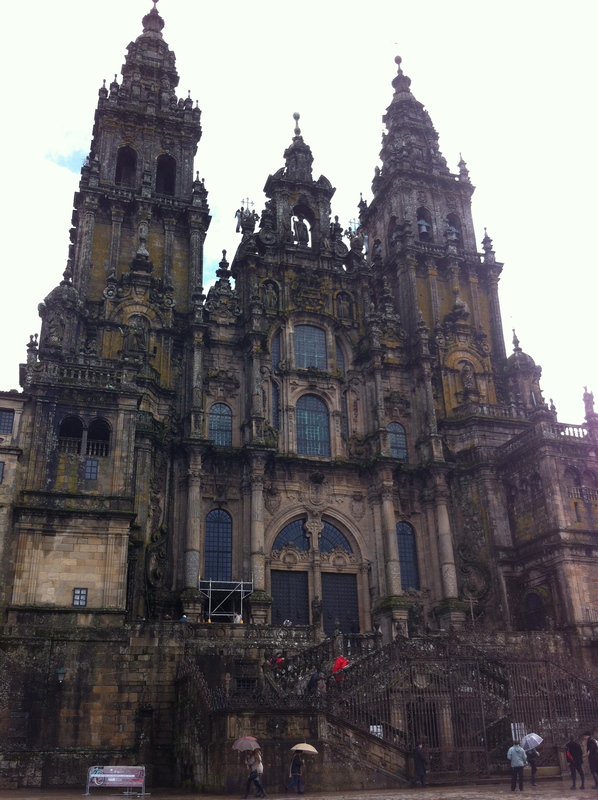 There it was, the imposing cathedral looming large before us. It didn’t matter that I hadn’t walked that day – it was an incredibly powerful moment to watch us all come to face our shared destination, arm in arm. 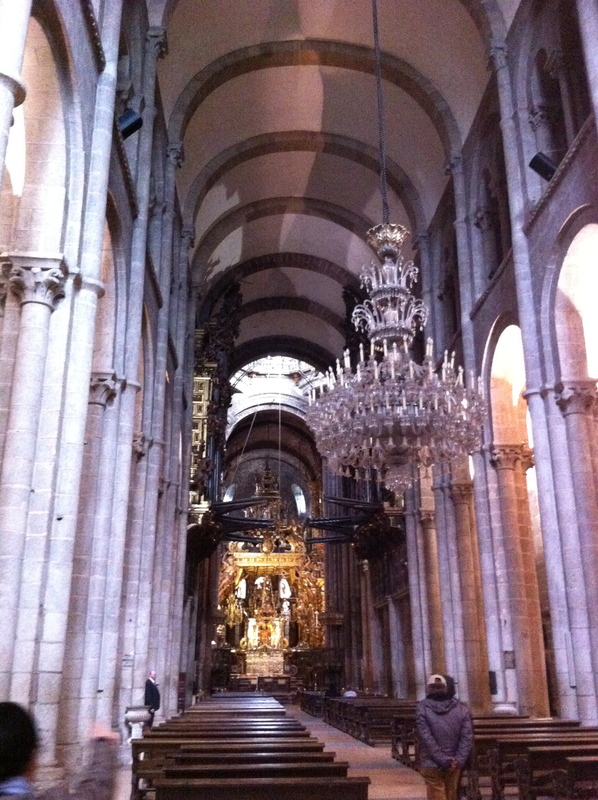 We climbed the steps (one last assault on the legs and feet, for sure) into the cathedral. I had thought that the kids would be as awestruck by the interior as I was some 30 years ago when I beheld it for the first time, that they would gaze in wonder at the statue of St. James. But they weren’t and they didn’t. They were focused on the end. 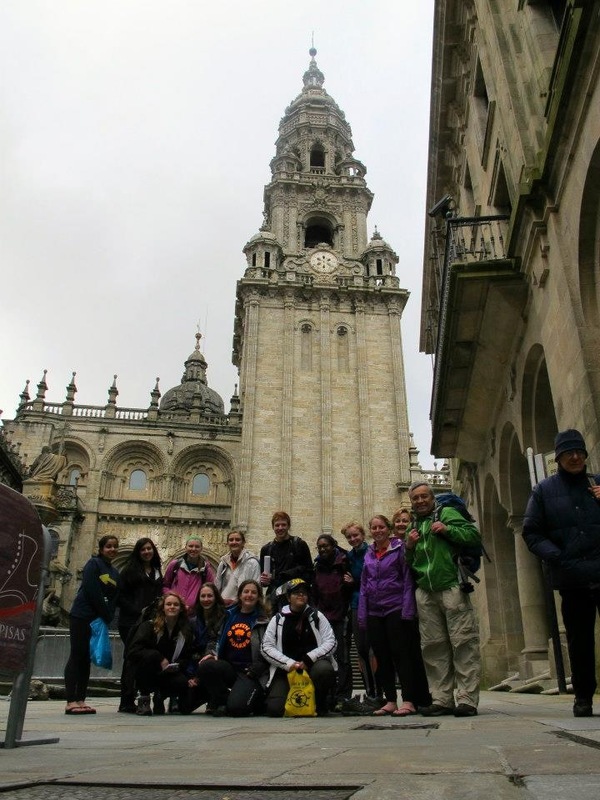 They were focused on getting the Compostela – the certificate granted to pilgrims who present their passports showing that they’ve walked at least 100 km – and having food and rest. 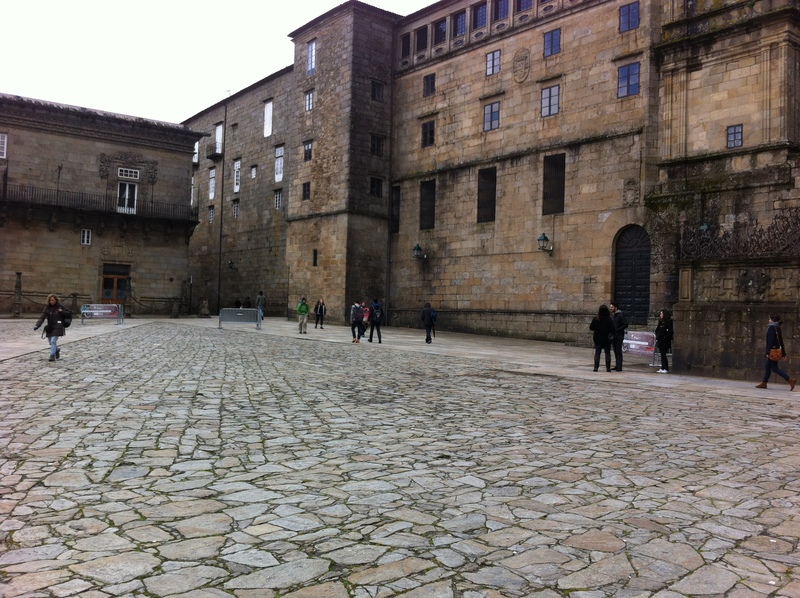 We found the office where compostelas are granted and the agents therein, seeing our ragged group, kindly granted each of us our certificates, in spite of the fact that only four of group walked the entire distance. The kids squealed in delight to see their names on the certificates, still written in Latin. I have to admit that I was also terribly excited to show my pasaporte de peregrinos at the desk and watch the lady put my name on the document. We all felt proud to hold in our hands something that officially recognized what we had done. Finally we were at our hotel in Santiago. It might as well have been the Four Seasons, so welcome were heat, hot water and real beds. We gathered for dinner freshly-showered and new again…well, ‘new’ except for shredded feet, ankles and knees. As we stuffed our faces with traditional Spanish foods from an abundant buffet, I looked around at the tables. The students were smiling, exchanging stories and bursting with laugher. They talked of their luxuriously long hot showers and baths, their gratefulness for wi-fi (21st century kids do so miss their cyber connections) and their excitement about departing for Barcelona in the morning. The happy chatter warmed my heart. Their resilience made me proud. I felt blanketed in a warm sense of camaraderie. I knew then that in spite of all the challenges this experience would be counted as a transformative one for all of us; that it will remain in our hearts forever as something ultimately wonderful. And that night I slept as though I hadn’t slept for years.